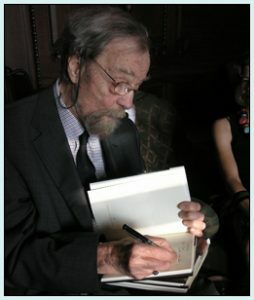 Donald Hall (1928 – 2018) was an American poet. He was born in New Haven, Connecticut, an only child. He pursued secondary school at Philips Exeter Academy, then earned a B.A. from Harvard University in 1951 and a B. Litt. from Oxford University in 1953. While teaching at the University of Michigan in Ann Arbor, Michigan he met poet Jane Kenyon, whom he married in 1972. Three years after they were wed, they moved to Eagle Pond Farm, his grandparents’ former home in rural New Hampshire. To date, he has published fifteen books of poetry, most recently The Painted Bed (2002) and Without: Poems (1998), which was published on the third anniversary of Jane Kenyon’s death. Most of the poems in Without deal with Kenyon’s illness and death, and many are epistolary poems. In addition to poetry, he has also written several collections of essays (among them Life Work and String Too Short to be Saved), a children’s book (Ox-Cart Man, which won the Caldecott Medal), and a number of plays. His recurring themes include New England rural living, baseball, and how work conveys meaning to ordinary life. He is regarded as a master both of poetic forms and free verse, and a champion of the art of revision, for whom writing is first and foremost a craft, not merely a mode of self-expression. Hall has won many awards, including two Guggenheim Fellowships and a Robert Frost Medal, and has served as poet laureate of his state. He lived and worked at Eagle Pond Farm until he passed away in the summer of 2018. Do you have any comments, criticism, paraphrasis or analysis of this poem that you feel would assist other visitors in understanding the meaning or the theme of this poem by Donald Hall better? If accepted, your analysis will be added to this page of American Poems. Together we can build a wealth of information, but it will take some discipline and determination.